I never cared much for Disney's princess marketing campaign. I'm not a big fan of Disney's movies anyway -- I think their stories are banal at best. Great animation, but the stories are trite and overflowing with moralistic platitudes. But I came across a quote about them recently that I think really speaks to why I dislike the idea. It comes from Andy Mooney, who was the Disney executive who came up with the idea of marketing the princesses as a campaign independent of their respective movies. 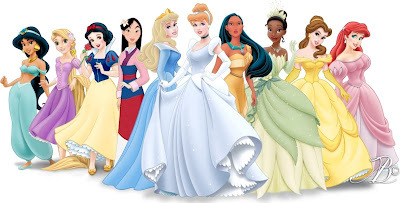 And the way the New York Times put it, "To ensure the sanctity of what Mooney called their individual “mythologies,” the princesses never make eye contact when they’re grouped: each stares off in a slightly different direction as if unaware of the others’ presence." Start looking at some of those group pictures and you quickly see that in action. There's never Snow White, Ariel and Mulan; it's Snow White and Ariel and Mulan. They're grouped together but never a group. There's no interaction at all. There's never anything going on. There's no story. And THAT'S my problem: there's no story. These characters are there strictly to be idly looked at, but nothing is to be done with them. I've heard people complain that the individual Disney movies generally promote a decidedly male-dominated society where women are supposed to be subservient in order to live happy and fulfilled lives, but this marketing is worse in my opinion because the characters' lives don't exist at all. They're less than subservient; they're no longer even characters, just background wallpaper. I like the artwork in comics, but if it's not telling a story, I'm going to call it out as a piece of crap. Regardless of how good any individual illustration inside may be. Comics are all about storytelling, and if they're not doing that, then they may as well just be a Disney princess.